Inflammation, which literally means “on fire,” is one of the main causes of premature aging and affects many Americans. 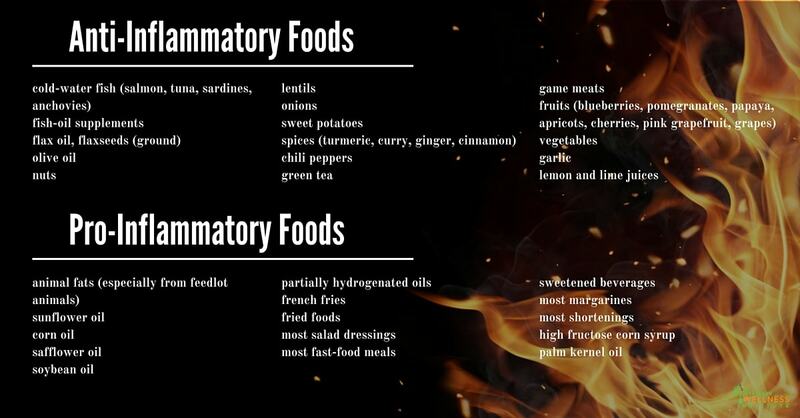 Inflammation can lead to several health defects. These simple tips on how to reduce inflammation only require minor changes in habit and diet. It probably comes as no surprise that a lean body is a healthier body. Unfortunately, Americans are some of the fattest people in the world. Fat cells produce wear-and-tear chemicals that slow your body down and divert its attention away from keeping you healthy. Remember to move. Studies show that exercise is an essential habit to reduce inflammation. It helps clean up that sticky stuff that accumulates in your brain, vessels, and joints. The Omega-3 oils found in fish (particularly cold-water fish such as salmon and tuna) are the most healthful foods you can eat to reduce inflammation. They keep the vessels clear and unobstructed, so your body doesn’t have to work so hard. Like many adults, your body needs an oil change from time to time. While Omega-3 oils are great for your body, some oils such as factory-processed vegetable oils have many pro-inflammatory traits. To balance this, try to keep your Omega-3 to Omega-6 oils in balance (as close to a 1:1 ratio as possible). As you age, your body rusts. Enter phytonutrients, the antirust nutrients found in plant-based foods. If oxidation is the rust in your body, then phytonutrients are the antioxidants you are seeking. The antioxidants in foods often work better in the body than do antioxidants in vitamin pills because of the biochemical activity called synergy. Graze on good foods. Grazing reduces swings in blood sugar, thus keeping insulin stable. Eat a high-fiber diet. Fiber slows the release of carbs into the blood stream, stabilizing the blood sugar level, therefore stabilizing insulin levels. Eat a right-carb diet. Carbohydrates partnered with protein and fibers are slowly released into the bloodstream and keep insulin from spiking. Junk carbs do the exact opposite. People who exercise vigorously at least 3 times a week have lower blood levels of inflammatory chemicals than do people who sit too much. Exercise stabilizes insulin, burns fat, and blocks the body’s production of pro-inflammatory substances. What you put into your body isn’t limited to food; studies show that the blood level of inflammatory substances goes up after people breathe polluted air. Joy and laughter have the ability to keep your immune system in balance. Excessive and unresolved stress causes the body to produce excess stress hormones such as cortisol. Studies have shown that people practicing relaxation techniques had higher blood levels of nitric oxide, the total-body health elixir. Dental health is very important to reduce inflammation in the body. Gingivitis is a common source of inflammation.